Parenthood returns September 13, NBC announced yesterday (see full list of NBC premiere dates). What Braverman family drama awaits when the third season kicks off? A new short-term love/lust interest for Crosby is being introduced, although Jasmine’s portrayer, Joy Bryant, will be back as a series regular. Amber may not have gotten into college, but she's still leaving the nest anyway, leaving Sarah distraught on the eve of her 40th birthday. 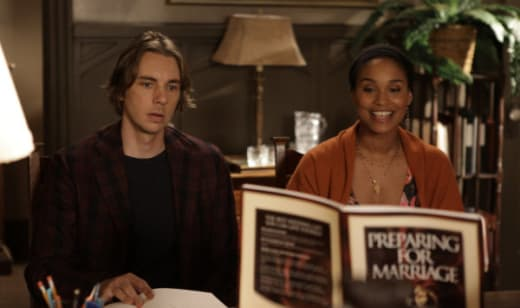 One of Haddie’s best friends grows concerned that Haddie’s romance with Alex is holding her back from enjoying her final year of high school. Adam and Crosby may go into business together, with the former joining the latter in his new venture, renovating an old recording studio. Julia will discover that the coffee cart girl at her office is planning to give up her baby for adoption. Wonder where they're going with that! Share your thoughts on all things Parenthood with us below.